BANGI, 8 Nov 2013 – Being unemployed is not a yardstick to the ability of an individual as it is not the fault of the job seekers but the system that has been built. That has resulted in many invaluable human resources remaining untapped, said Nobel laureate Professor Muhammad Yunus here today. Prof Muhammad Yunus, The National University of Malaysia’s (UKM) Laureate in Residence said in an interview with UKM’s News Portal here today. He said every unemployed person should think about becoming a job giver instead of a job seeker. Only then will they stop thinking within the narrow parameters set by employers. This, he said, can come about when a person reactivate his creative power that has been dormant within him. “Thinking in this manner, makes the unemployed see opportunities instead of being in despair”. Opportunities are like buses as there will always another one coming. “Under the current situation a machines gets better attention than an unemployed person. If a good working machine is left unused, the owner of a factory will be worried because it is not producing and he will do all he can to get it running. “Strangely if a person is unemployed the same attention is not given on how to unleash the innate creative capacity of that person. “Instead the failure to unlock the idle human potential is dismissed as a political problem that needs to be dealt with by the government before the unemployed march on the streets in droves”, Prof Muhammad Yunus said. “The micro credit system that he started proved that those rejected by the system can be self reliant. It gives the key to the poor to unlock their potential. “The microcredit loans became a tool to unleash human creative power which many never imagine the deprived people really had. “They were always thought to be dependent on somebody else. They are supposed to be maids in our houses and suddenly they become entrepreneurs and start running a factory because they produce things from their homes,” he said. Yet now the unemployed people are regarded as a problem that needs to be dealt with when actually they are hidden resources that needed to be tapped. “If the poor can transform themselves into entrepreneurs, by simply giving them the resources they needed, there is nothing stopping the unemployed doing better than the poor. “Human are not passive being that sit on the shelves to be picked by employers. They are active, self reliant and posses creative powers to make things happen”. He said that kind of mindset is a more accurate picture of human ability and everything then needs to be redesigned. The academic world prepares the younger generation to be fully ready to be picked by employers, either in government, private sectors or NGOs. However they needed to carry out research about the new structure, a structure that allows businesses to be judged on how well they solve society’s pressing problem and not on how much profit they can make. “This social business allows every individual to explore themselves and how they can not only take care of themselves but others as well”. 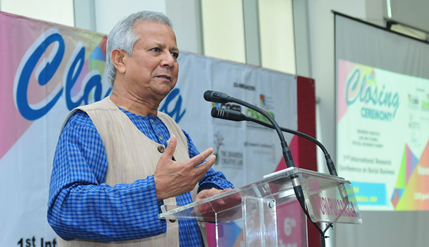 Prof Muhammad Yunus was attending the 1st International Research Conference on Social Business here. Also present was Tunku Ali Redhauddin Tunku , the Royal Fellow of Centre of Entrepreneur and SME Development together with participants and stakeholders from all over the world. The conference was organised by UKM together with The Grameen Creative Lab Germany.